At Aloha Surf School, all of our surf lessons are conducted in a supportive, fun environment with an emphasis on safety and enjoyment. 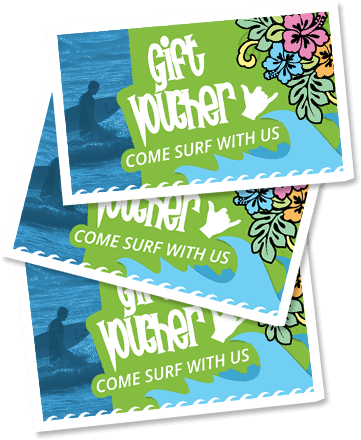 We run surfing lessons for adults, group and individual lessons and also kids surf lessons in our 5 day Kids Camps. We also run Hardboard Intermediate Coaching Sessions and Stand Up Paddle Surf lessons. Surfing Lessons are 2 hours long and take place in waist depth water under the careful supervision of our surfing instructors who are in the water with the surfers at all times. At Aloha you´re not just another sheep in the flock! 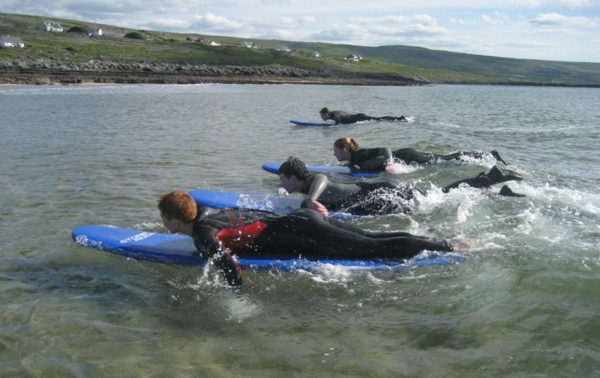 So unlike other schools our groups are kept small, so surfers greatly benefit from the close personal attention of our professional instructors who are all qualified RLSS Beach Lifeguards and ISA Surfing Instructors. While the focus of the surf lessons is learning to surf, you will also gain valuable information regarding surfing etiquette, beach safety and knowledge of the ocean. The first section of the surf lesson consists of some dry land exercises where you will learn the techniques of wave selection, paddling, catching the wave and then standing up; the reason you’re here!! Practising the skills on a stable surface makes it easier to learn the right techniques before taking the plunge. The second section of the lesson is out there in the surf putting all that you’ve learnt into practice. We provide special soft boards for beginners, wetsuits and wetsuit booties. So all you need is your swimming kit, towel and lots of energy!